: Add or to your mana pool. Activate this ability only if you control a Swamp. Tainted Field and Tainted Wood are nice if you can fetch a swamp easily. Just to keep you updated with the new cards, Baird, Steward of Argive is good pillowfort. Sanguine Bond helps with the strategy. Ohran Viper is effectively a draw engine due to its "deathtouch". Kodama's Reach should replace Nissa's Pilgrimage . 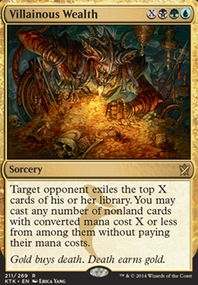 Mentor of the Meek got reprinted and it's cheap now. Kambal, Consul of Allocation is nice in every deck. Painful Truths is cheap card draw. Solar Tide pulls a good work here. 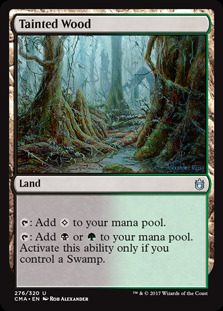 The most easy upgrade would be for your lands, there's a ton you could add such as Dakmor Salvage , Svogthos, the Restless Tomb , Hissing Quagmire , High Market , Command Tower , Overgrown Tomb , Woodland Cemetery , Westvale Abbey Flip, Bojuka Bog , Evolving Wilds , Grim Backwoods , Tainted Wood , and Golgari Rot Farm . I will think of more things at another point when I have more time, if you in turn have any suggestions feel free to give any of my edh decks a look, perhaps my Meren of Clan Nel Toth decklist might give you some ideas in the process. Hey, Meren is one of the most played casual Commanders. 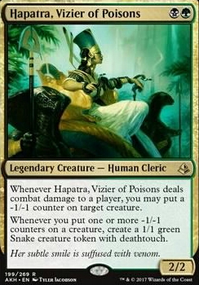 She's the number one pure Golgari Commander, there's thousands of decks built around her. Command Tower : every multicolor deck in Commander should play this land. High Market : sac outlet. No mana cost self-sac (Sakura and Frog) is the game plan to get a lot of value and experience counters quick with Meren. Sakura with Meren can create a huge amount of ramp from basic lands. 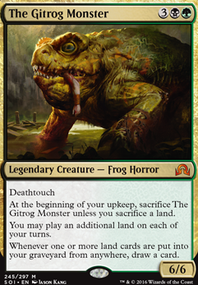 Frog can be a repeatable fog effect to keep you alive while getting value/experience from Meren. Skullclamp is a busted card for draw when you're sacing creatures. 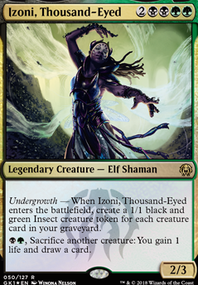 Buried is like a powerful tutor with Meren's reanimation ability because putting certain creatures into your graveyard gives you access to them. Fauna lets you discard a creature and then tutor for any other creature. 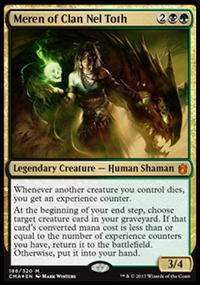 She's good to first put a support creature into your graveyard who you can then reanimate with Meren while also tutoring for another creature such as Witness. Intent is a powerful tutor with Meren, gives you experience/creature sac and a card. Loop it with Witness to tutor for all your powerful cards. Protean Hulk + Phyrexian Delver + Viscera Seer is a budget combo that can tutor for and give you a lot value from creatures and experience. Hulk when it dies being able to tutor for reanimation and a sac outlet is very good. The nice thing about these cards are they are all repeatable sac and most have no mana cost activations to sac a Sap. Ashnods is not a budget card, but I'm suggesting it because it's very good with Slimefoot since you make colorless mana when you sac a creature. Skullclamp is amazing draw with 1/1 Sap tokens or sac outlets. Command Tower: one of the best lands in Commander. Necrogenesis: exile your opponent's creature in their graveyard to make a Sap. Intent is not a budget card, but I'm suggesting it because it has a very powerful effect when you sac a Sap. I offer more help. If you like some of these suggestions I can help you to make cuts. Maybe you should consider more mana fixing, because it is a 4-color deck after all: Command Tower, Exotic Orchard, Caves of Koilos, Llanowar Wastes, Darkwater Catacombs, Sunken Hollow, Tainted Wood, Opulent Palace, Sandsteppe Citadel, Arcane Sanctum, Seaside Citadel, Murmuring Bosk, Path of Ancestry, Evolving Wilds, Terramorphic Expanse, Vivid Marsh.